We are your direct source for gems minerals and crystals from Brazil and around the world. We have been importing crystals directly from Brazil for over 20 years, and through our network of suppliers throughout Minas Gerais and Rio Grande do Sul, we are able to provide an amazing selection of unique and premium mineral and crystal varieties. and can provide a wide variety of crystals and minerals from around the world. While we don't have regular hours, we're usually open 12:00-6:00 pm daily, except Monday. If you would like to schedule a viewing appointment, or make sure we'll be open, send us a message via our contact form, or an email to treasurecrystals@ icloud.com. We can also show material via Skype, FaceTime, or photos sent by email or text message. Our extensive retail store, gem and crystal show, and wholesale experience is a huge help for giving practical advice on the best styles, displays, marketing tips, and crystal information, to ensure your success. ​We can also show material via Skype, FaceTime, or photos sent by email or text message. Our extensive retail store, gem and crystal show, and wholesale experience is a huge help for giving practical advice on the best styles, displays, marketing tips, and crystal information, to ensure your success. You can reach Seann directly at 707-249-2873. We attend mineral shows throughout the year around California. See below for upcoming events! Gifts, Decorator Items, and More! New Material Available from Brazil, Uruguay, and Peru! 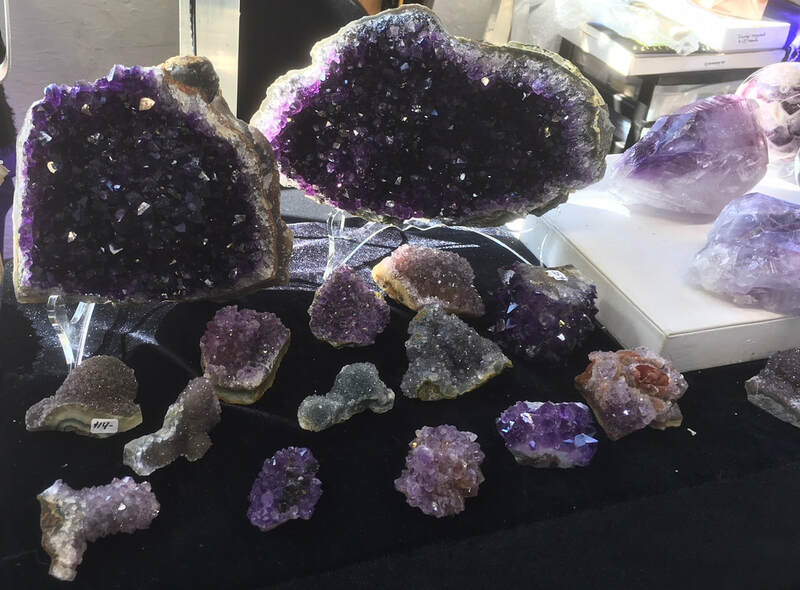 Amethyst Druzes from Uruguay, Beautiful Amethyst Clusters and Geodes (no cement!) from Brazil, Extra Grade Amethyst Points (all sizes) from Brazil and Uruguay, Polished Agate Geodes, and Selenite Crystals, Rough and Polished Premium Rose Quartz Free Forms, Rough Pink Peruvian Opal, Blue and Black Kyanite clusters with Pyrite, Black and Green Tourmaline, Natural and Tumbled Auralite-23, Clear and Smoky Natural Crystals from Diamantina, Polished/Included Crystals with Rutile, Clear Faden Crystals, Miniature Quartz Clusters, Polished Smoky Crystals, Lemurian Seed Crystal Pendulums, Gem and Crystal Pendants set with Sterling Silver, Natural Citrine Crystals, Polished Citrine Points, Spheres, and Skulls, Polished Smoky Citrine and Morion Quartz, Pink Lemurian Seed Crystals - all sizes, Extra Premium Amethyst Flowers, Amazing Polished Elestial (Jacaré) Crystals, Polished Amethyst Crystals, Clear, Rose Quartz, and Amethyst Hearts, and more! ​Call, text, or email us if you would like to set up an appointment for a private viewing - in person, by FaceTime, or via Skype.